I finally picked up a hard to get kit off Ebay. Apart from my myriad of 6mm and Napoleonic activities, I am also working on Afghanistan gaming using 20mm (1/72) and Ambush Alley rules. I recently purchased some painted US vehicles and Liberation miniatures off Ebay and purchased some locally produced Wartime Miniatures Aussies. I intend to build US, Aussie and Brit units to operate with. For the Aussies I purchased a prebuilt ARH Tiger by getting the German one and having a mate respray with ADF colours. Today I won an auction on Ebay for the only MRH90 model you can get to date. 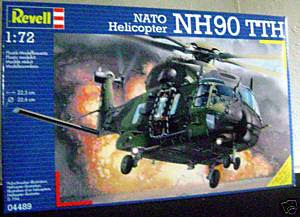 It is produced by Revell and is actually a NATO NH90 which is slightly different to the Aussie MRH90. The average punter would not be able to see the differences especially when its painted in ADF colours. The only problem remaining will be how to do the Aussie decals and markings.